Boreal forests are important as a major sink for CO2 (Bonan and Vancleve, 1992; Gower et al., 2001; Goodale et al., 2002; Liski et al., 2006). However, this is true mainly for forests with a high net production of biomass, while in regeneration and declining phases, forests will function as sources of respired CO2 due to the decomposition of wood and other organic material. Models of wood decomposition have usually not explicitly included variation in the fungal community (Makinen et al., 2006), rather the decomposer community is treated as a 'black box' (Hyvonen et al., 2005; Montes and Canellas, 2006). However, there are substantial differences in decomposition rate depending on the species involved (Tanesaka et al., 1993; Osono and Takeda, 2002; Urcelay and Robledo, 2004) and the complexity of the community. Intermediate complexity might be the most efficient in decomposing wood. In an experimental study with combinations of 1-16 wood-decay species, the highest community wood decomposition rate was in species combinations with intermediate complexity (Toljander et al., 2006). This was particularly true when the temperature was fluctuating between 7 and 31 °C. Presumably, competition suppressed decomposition in the most complex communities, while the intermediate complexity allowed for adaptation to fluctuating environmental conditions. The decay community is influenced by the amount and quality of resource present. Wood from fast growing trees decays faster (Edman et al., 2006), but Heijari et al. (2005) showed no consistent relationship between fertilization and durability of Coniophora puteana in pine or spruce wood following long-term fertilization. Managed forests contain only 5-40% of the quantity of dead wood present in natural forests and as a consequence harbour a much lower diversity of species (e.g. Lindblad, 1998; Fridman and Walheim, 2000). When trees die they may remain standing or as dead snags for a time, during which decomposition is slower than for fallen logs. In particular, dead pine (Pinus) trees may often remain standing for extended periods (even up to 200 years) as 'kelo trees' before falling (Niemela et al., 2002; Rouvinen et al., 2002). The time spent as snags has been implicated as a major factor responsible for the variation in decomposition rate of dead wood. Vanderwel et al. (2006) reported that snags remain for 90 years while fallen trees remained for only 55-60 years in white and red pine (Pinus strobus and P. resinosa). Krankina and Harmon (1995) showed a higher decay rate for birch (Betula spp.) with an average time to disappearance of 28 years, and 20% of standing volume in dead wood. Siitonen et al. (2000) indicated even higher proportions of dead wood in old growth—33% of the total volume of wood of which snags made up 30%. Decay rate is also affected by temperature; Kueppers et al. (2004) found decomposition rate doubled in sites that were on average 3 °C warmer. Since primary production is less sensitive than decomposition to changes in temperature, boreal forests have a tendency to accumulate more dead organic matter than temperate forests. Regeneration of seedlings is greater and growth is better among decaying wood than in the surrounding soil, particularly in coniferous forests (Szewczyk and Szwagrzyk, 1996; Gray and Spies, 1997; Hornberg et al., 1997; Takahashi et al., 2000; Kuuluvainen and Kalmari, 2003; Narukawa et al., 2003; Baier et al., 2006). Decaying logs may provide better microclimatic conditions including a more balanced water regime, and better nutrient status due to reduced competition with large established root systems. Decomposing logs may also be an important site for interaction between wood decomposers and mycorrhizal fungi (Lindahl et al., 1999, 2001; Leake et al., 2001; Tedersoo et al., 2003), or for multifunctional fungal species (Vasiliauskas et al., 2007). Brown-rot fungi play an essential role in the functioning of coniferous (boreal) forest ecosystems (Gilbertson, 1980, 1981). For example, brown-rot residues, which may make up to 30% of the upper 30 cm of soil in coniferous forests (e.g. Harvey et al., 1976), increase the soil water holding capacity and provide a favourable environment for seed germination and seedling establishment (Jurgenson et al., 1977). 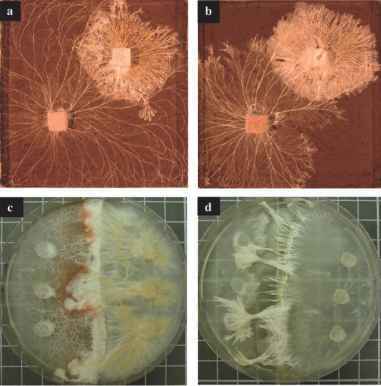 Brown-rot residues provide a main site of ectomycorrhizal development (Harvey et al., 1976), and also a site of nitrogen fixation in coniferous forest soils (Larsen et al., 1979).